Phison likes playing the role of underdog with the ability to disrupt the SSD market. The S10 took some time to perfect, but once it was fully enabled, it took a bite out of competitors' low-cost 4-channel controllers by utilizing an 8-core processor and a full 8-channel design. When companies planned to take over the entry-level NVMe SSD market with low-cost dual-core controllers running over PCIe, Phison again bit down with a high-performance design that competed nearly dollar-for-dollar but with superior performance due to an advanced controller with more processing power. In the second round of cost effective NVMe solutions, Phison looks strong. The company will once again take a different approach than competitors. The PS5008-E8 uses a PCIe 3.0 x2 connection back to the host to reduce cost but features a powerful multi-core controller to handle background activity. Many of the other entry-level NVMe solutions we've seen at Computex 2017 utilize only 2-cores that place more strain on the processor and reduce overall performance. Time, along with our own custom testing, will determine which solution provides better performance and a lower price point for users. We won't have to wait long to find out. 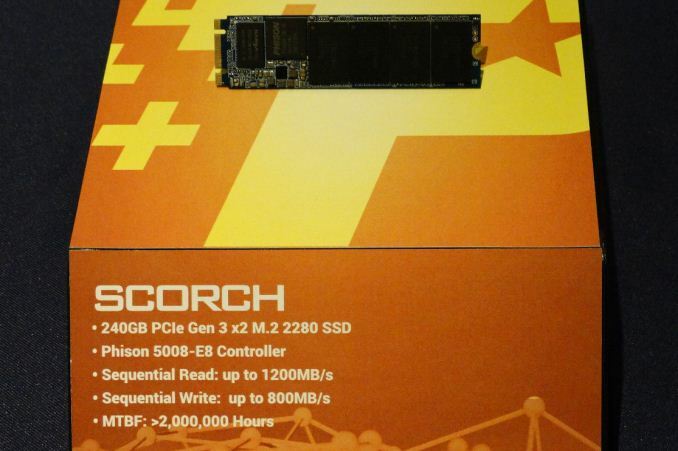 Patriot told us the new Scorch NVMe SSD will enter production soon and ship in early Q3. We may see these products as early as July. We don't know final pricing and any numbers given now would only be educated guesses. The Scorch will utilize Toshiba's 64-layer BiCS FLASH with 3-bits per cell (TLC). Toshiba only recently began ramping up production volume of SSD-grade NAND. Once the production lines are fully engaged BiCS FLASH will ease supply side constraints on NAND and bring us out of the shortage. Patriot tells us to expect sequential read performance up to 1,200 MBps and sequential write performance up to 800 MBps. Competitors' controllers will enable higher sequential write performance, but the performance will only come in bursts since all of the next-gen entry-level NVMe SSDs use TLC NAND. The peak increase comes only from bursts and are enabled by the PCIe 3.0 x4 connection back to the host. Phison chose to engineer a product with more processor cores that should enable higher sustained and mixed workload performance. Phison will lose the marketing battle on paper but may win the war.